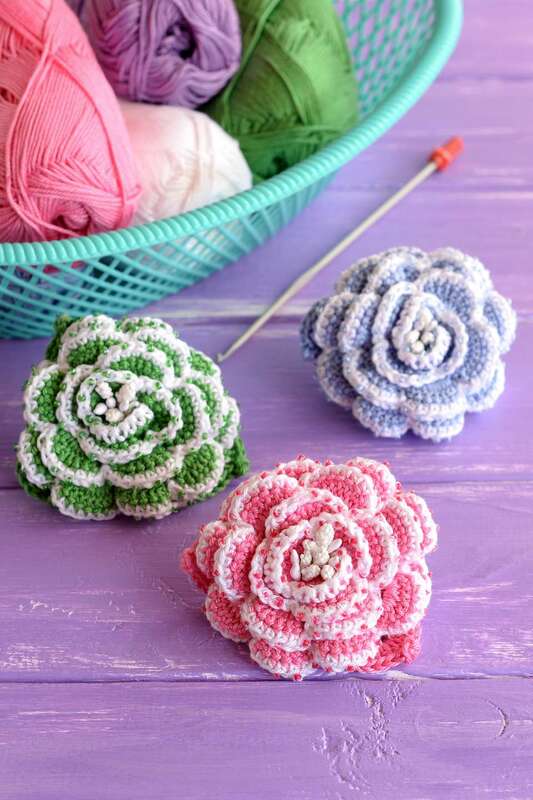 This easy little 3D crochet flower makes a great accent on a hair clip, pin, or hat. See the Daisy Mae Cloche for an example of the 3D Crochet Flower in action. To substitute yarn you will need approximately 15 yards (8 grams) of a worsted weight. Adjust hook sizes as necessary to achieve gauge listed below for similar size flower. Gauge is given as a reference only. It’s not critical for this project. Ch 4 loosely, sl st in first ch to form ring. Foundation Rnd: Ch 2 (counts as 1st hdc), 9 hdc into center of ring -- 10 hdc. Rnd 1: Ch 3, sl st in same st, sl st in next st, *sl st in next st, ch 3, sl st in same st, sl st in next st; rep from * 3 times more, sl st in base of beg ch-3 to end rnd. Rnd 2: Ch 3, 5 dc in ch-3 sp, sl st in next st, *sl st in base of next ch-3, ch 3, 5 dc in ch-3 sp, sl st in next st; rep from * 3 times more. Make a second piece in the same manner. Lay flower petals on top of each other so bottom layer shows between the petals of the top layer. Secure together by placing button on top layer and sewing through to join all pieces.